The question here is “what is the relationship of this chapter to chapter 9? Is this, like all the previous chapters, actually “hard wired” to the previous chapter? In chapter 9 we saw a gigantic struggle between the “locusts” and the “horses,” with the “third of men,” who tormented the “horse” people for “five months,” being killed in the pitched battle of the fifth and sixth trumpets or the “first” and “second” woes. At first glance, a quick survey of this chapter seems to bear no relationship to chapter 9 except verse 7. There “the voice of the seventh angel” is “sound[ed].” The “seventh angel” is clearly sequential to the sounding of the “sixth angel” in chapter 9! Therefore, John is introducing some additional material in a parenthetical manner to the sixth trumpet scenario of chapter 9 in order to prepare us for what comes next. As we precede, we will this chapter to be primarily retrospective in relation to chapter 9. The Commentary agrees, suggesting that “Chapters 10:1 to 11:14 constitute a parenthesis between the sixth and seventh trumpets.”  However, since it is clear that the “trumpets” are post probationary, it is more likely that the parenthetical portion must end in verse 7 of chapter 11 where the testimony of the two witnesses “is finished.” That suggests that verses 7 to 14 of Revelation 11 actually completes the scenario of the sixth trumpet; and also delineates Revelation 10:1 to 11: 6 as the parenthetical portion lying somewhere in the mist of the sixth trumpet, with the seventh following at the end of the sixth. Remember that “the second woe” (Rev.11:14) is also the the sixth trumpet (see Rev.8:13). But, in the meantime, lets commence our study of chapter 10. 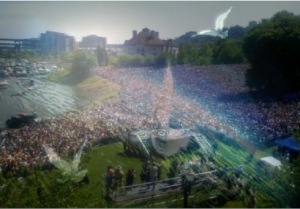 This picture is an illustrative attempt to show what John sees. Each feature is full of significance. John saw the angel’s head, face and feet, but could not see his trunk because it is “clothed with a cloud.” His brilliant “face” surrounded by a “rainbow” and his fiery “feet” bear deep relevance to the scenarios of chapters 8 and 9 because they depict the generally confused religious condition of all the people of the world during the trumpet scenarios. Although the previous “angel” was “the sixth angel which had the trumpet” in Revelation 9:13, this “. 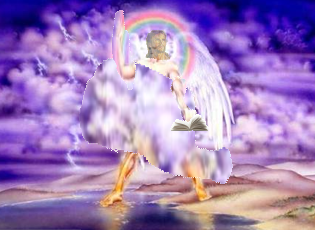 . . mighty angel who instructed John was no less a personage than Jesus Christ”  who had issued the trumpets to his servant angels in Revelation 8:2. His was the “voice” heard “from the four horns of the golden altar . . . saying to the sixth angel which had the trumpet, Loose the four angels which are bound in the great river Euphrates” in Revelation 9:13. A short time before He had placed “much incense . . . upon the [same] golden altar which was before the throne” in Revelation 8:3. Note that “his feet as pillars of fire” are identical to Jesus’ “feet like unto fine brass, as if they burned in a furnace” in Revelation 1:15. Looking again at Revelation 9:13, which was after He “came and stood at the altar” and had “cast” the “censer . . . into the earth” in Revelation 8:3, 5, we only heard His “voice” speaking “from the four horns of the golden altar” which appear to represent justice without mercy because Jesus was not there neither was any blood placed upon the horns. The incense that was placed on the altar, did not touch the horns. Then, with the release of the “four [bound] angels” in Revelation 9:14 John saw those strange “horses” used to slay “the third part of [the] men” in Revelation 9:15, 18. Evidently, those “men,” “which [had] not the seal of God in their foreheads,”  had been attacked and tormented previously by the locusts for “five months” in Revelation 9:5,10. Consequently, the horse attack was in retaliation to the five month period of “torment” that was inflicted by the people represented by the “pale horse” of Revelation 6:8 against those of the “red horse” of Revelation 6:6:4. That shows us what Satan will do even to those who serve him after God’s restraining power has been removed. Such treachery becomes apparent when the “key” is given to the “star” who fell “from heaven unto the earth” in Revelation 9:1. His name, according to Revelation 9:11, is “Abaddon” or “Apollyon” the destroyer. 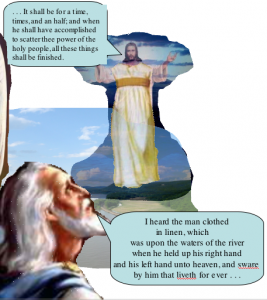 Therefore, the “cloud” clothes Jesus represents the “mystery of [who] God” is. It is a mystery to the wicked because they had blinded themselves to the truth. As a result, only two options are opened to them with some believing Wormwood is God, while others believe Abaddon to be the deity instead of the true God. Satan moves them to engage in the bloodiest conflict that will ever be fought. As ironic as it is, everyone on either side of the conflict, whither of Wormwood or of Abaddon, are all, equally pathetic victims of the worst tyrant who ever lived. In this scenario, Satan favors no one. He manipulates them unmercifully according a scheme he has long been planning. Ironically, his plans will certainly be based on the very prophecies we are reading right now! No wonder he must do all he can to keep all ignorant of his schemes because they expose just what he is going to do! So, the ignorance and confusion especially regarding the information provided in book of Revelation, even in Adventist circles, is very much a part of his plan to defeat the purposes of God. Therefore, the whole world, with the exception of those who had received “the seal of God in their foreheads,” will be victimized by this terrible, future delusion. All, accept the faithful, will worship at the feet of either Wormwood the false Christ, or Abaddon the destroyer. For that reason, John sees Christ “clothed with a cloud” symbolizing “the mystery of God” depicted in verse 7. Satan will have enveloped the whole world and fastened them in impenetrable spiritual darkness from which there will be no deliverance. The “cloud” augments the significance of the “bottomless pit” metaphor to which Satan was given the “key” to in Revelation 9:1. But that transfer of power and authority must have actually taken place when the “four angels standing on the four corners of the earth” HAD released their hold on “the four winds of the earth” just before the first trumpet was sounded, and just after Jesus cast the “censer into the earth” in Revelation 8:5. 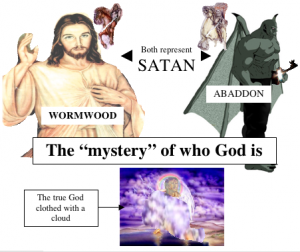 So, the “cloud” Jesus is “clothed” with represents the deep mystery of who God really is. He cannot be blamed because the wicked had chosen their state of confusion by default. They rejected the plain testimony of the loud cry given during the time of the sixth seal (Revelation 6:12 to 7:17) when the earth was “filled with the knowledge of the glory of the LORD, as the waters cover the sea” (Habakkuk 2:14). The 144,000 (white horse people) called out the “great multitude (of black horse people) which no man could number” (Revelation 7: 4-10). The rest, under the icons of the red and pale horses, fell under the unlimited control of Satan to do with them as he wished. But, understand this: even though the five months ended right on time, the saints will still be unable to set a date for the second coming. Nevertheless, they will be aware of the next event including the end of the horrible counter attack represented by the sixth trumpet of Revelation 9:13-21 and 11:7-13 that corresponds to Daniel 11:40-43. Some mistake this “little book” to be the sealed “book” of Revelation 5  that was held in the hand of God the Father and taken by God the Son. But, the “book” of Revelation 5 cannot have been opened at this time because one seal more remains to be loosed. In contrast, this “little book” is already “open.” Also this “angel” is the same Person that “took the [other] book” in Revelation 5:7. Furthermore, the “book” of Revelation 5 contains “the roll of the history of God’s providences, the prophetic history of nations and the church. Herein was contained the divine utterances, His authority, His commandments, His laws, the whole symbolic counsel of the Eternal, and the history of all ruling powers in the nations. In symbolic language was contained in that roll the influence of every nation, tongue, and people from the beginning of earth’s history to its close.”  Therefore the “book” of Revelation 5, is a book depicting the character and behavior of humanity throughout history. It will be open, or completely unsealed for the saints in heaven only after “judgment was given unto them . . . and they lived and reigned with Christ a thousand years” according to Revelation 20:4. That book contains the evidence needed for them to pass “judgment” on the wicked, some of whom sought the shelter of the rocks and mountains in Revelation 6:16-17. 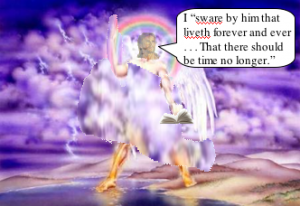 The “message in relation to time” is found in Revelation 14:7 where “the hour of his judgment is come” which came at the end of the 2300 day “mar’eh”  of Daniel 8:14. During that “hour,” Jesus left the holy place in the heavenly sanctuary and passed into the most holy place October 22, 1844 to begin the investigative judgment in heaven. In the meantime, on earth, the three angel’s messages delineates the work of the church. As we have just read, the “masterly working of” Satan, disguising himself as Abaddon and Wormwood and uniting “with evil men,” will have reached its “height.” Satan will be able to achieve such unity because “the whole world and the churches [did not] receive . . . the love of the truth.” “And for this cause God shall send them strong delusion, that they should believe a lie:” (2 Thessalonians 2:11). And what a “lie” it will be! 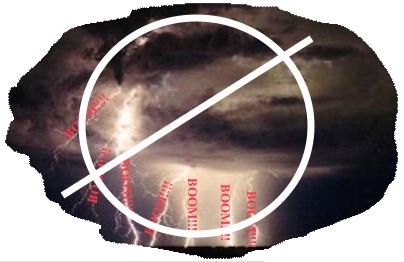 This loud, ear splitting symbolism is suggestive of a thunderous proclamation that cannot possibly be ignored. It warns the world of what is about to come, giving everyone a chance to prepare as well as eliminating any excuse for being snared in Satan’s trap which will be sprung during the post probationary scenarios of the seven trumpets outlined in Revelation 8 and 9. Do those “seven thunders” have anything to do with the “seven trumpets?” Very likely they do, but God, according to the next verse, has closed the window on the subject of the “seven thunders” for now. 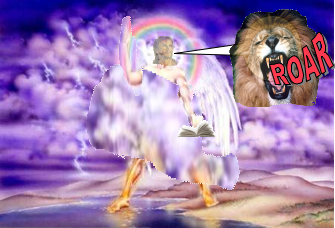 Therefore, the complete fall of Babylon, announced by the “second angel” is still future, and the full proclamation is also future when Jesus’ “loud voice” will be echoed by His servants throughout the world under the full power of the Holy Spirit even after “their faith” has been “tested” by the opening of the “fifth seal” of Revelation 6:9-11. 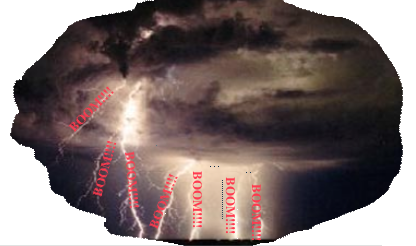 Possibly, that is the time when “further light” expressed by the “seven thunders” will be disclosed. An “oath,” in this case, is not a complaint, but a pledge. His stance “upon the sea and upon the earth” while uttering this pledge, must represent His determination to bring the great controversy with Satan involving the whole world, and which has been going on far too long, to an end. His position “shows the part which He is acting in the closing scenes of the great controversy with Satan” and “denotes His supreme power and authority over the whole earth,” a fact which is tremendously reassuring in view of the context depicting Wormwood and Abaddon, in chapters 8 and 9, having a field day with the inhabitants of the earth. The people know not they are under the most horrendous delusion ever perpetrated upon humanity. They will experience what its like to live without the restraining power of God. This will come after his angels stationed on the “four corners of the earth,” in Revelation 7:1-3 holding back the “four winds” of Satanic power, will have released them. Most have concluded this means there are no future time prophecies to be considered in either Daniel’s or John’s prophecies. But, as we have already discovered in both books, there truly are some time prophecies remaining that have not yet been fulfilled, not the least of which, are those of Daniel 12 as well as the “five months” of Revelation 9. 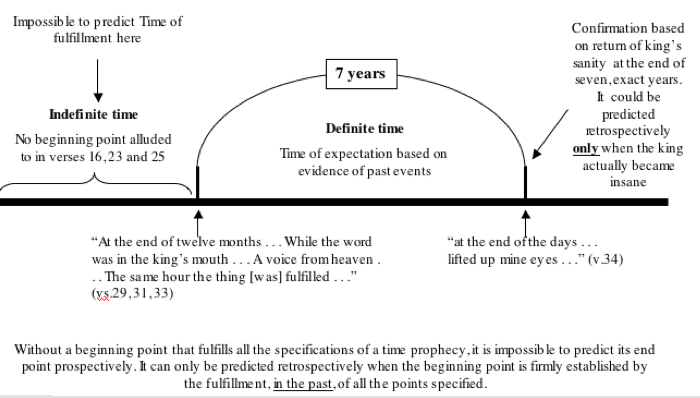 One major failure of those who hold to the traditional understanding of all the time prophecies is neglecting to define the term “definite time” which Mrs. White uses repeatedly  in her comments regarding time prophecies. 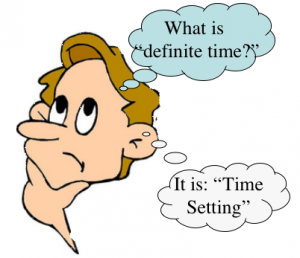 But, what is “definite time?” Even though the Commentary observes that after 1844 “there is to be no further message bearing on a definite time,” it fails to define what “definite time” is. Rather, it adds, “No time prophecy extends beyond 1844.”  If that were truly the case, we would be obliged to renounce the future application of the “thousand years” of Revelation 20, would we not? That understanding does not violate the “no definite time after 1844” principle because it is not time setting as we have been cautioned against. Therefore, we must conclude that the “thousand years” of Revelation is “indefinite time.” It is “indefinite” because its beginning point (the time of Christ’s second coming) cannot be established. The same principle holds true for the 2300 days that were revealed to Daniel. When God told him “unto two thousand and three hundred days; then shall the sanctuary be cleansed,” he had no idea when it would begin even though he may have supposed it would begin 2,300 years from the time he was living right at that moment. Later he was told that the “mar’eh” in Daniel 9:23,  that Gabriel asked him to “consider,” would begin when “the commandment to restore and to build Jerusalem” was issued as we read in Daniel 9:25. Since it is God Himself who “declared” “the mystery . . . to his servants the prophets,” all the writings of “the prophets” from Moses to John’s Revelation reveal “the mystery  of God.” “The word of God is to be the guide book, the counsellor, the teacher in the highest class of education. The Bible teaches the whole will of God concerning the plan of salvation, and if men are ignorant, it is because they do not choose to be wise.”  Such choices leave them inexcusably ignorant unlike the people represented by the “black horse” of Revelation 6:5 whose ignorance is excusable. Consequently, the great majority of the human population is just as ignorant of God and the plan of salvation as if it had never been written. WhenWormwood and Abaddon appear, there will be nothing to shield them from Satan’s overwhelming deceptions. By that time, the “great apostasy” will have “develop[ed] into darkness deep as midnight, impenetrable as sackcloth of hair” and the “Darkness will become more dense in human minds after the truth has penetrated and been rejected.”  The true God, that can be seen only with the eye of faith, is invisible to the faithless multitude who turned their backs to God when the brilliant light of the “loud voice” off verse 3 gave the warning message. But, the finishing of this “mystery,” predicted to occur “in the days [or the time period] of . . . the seventh angel,” suggests that the “cloud” the “mighty angel” is “clothed with” in verse 1, will be swept away during the time of the seventh angel or “third woe.” Then, the real God will manifest Himself to all. That must be the “overwhelming surprise” that “is to break upon the world” when transgression had “reached its limit.”  But, their acknowledgment will not save them because “without faith, it is impossible to please . . . God” (Hebrews 11:6). As the Commentary observes, this is “doubtless the voice that had forbidden John to write what had been declare by the seven thunders” in verse 4  and probably the same “voice from the four horns of the golden altar” Revelation 9:13. However, this must be a retrospective view in contrast to the post probationary time of the trumpets, because the invitation to “take the little book” that is “open” suggests God’s wish to engage humanity it is study, an effort that would bear fruit only during probationary time. It would be fruitless and vain during post probationary time. Having already understood from our study of verse 2 that “the little book” is the book of Daniel, the command to “eat it up” suggests more than just a cursory look at its contents. It was to be devoured and digested. Even though Adventists have always considered John’s action in these verses to represent the movement called the “midnight cry” prior to 1844 , we do ourselves an injustice by relagating it strictly to history and consider it irrelavent to us in our time. Not so! This is a Divine imperative that still stands. We too must “eat it up” whether is tastes sweet or bitter and let it become a part of us. Verse 10: And I took the little book out of the angel’s hand, and ate it up; and it was in my mouth sweet as honey: and as soon as I had eaten it, my belly was bitter. One wonders if there is a possible relationship between the “sweet bitter book” experience John was instructed to act out here and the “waters” that were contaminated by “Wormwood” and “made bitter” in Revelation 9:10,11. While the “waters” contaminated by “Wormwood” likely represent truth mixed with deliberate error that was fatal because “many men died of the waters” even though they should have known better, the bitterness of the book that John tasted came about because of an honest misunderstanding of a time prophecy in the book of Daniel. Nevertheless, “it was in the Lord’s order” that the disappointment should come from that misunderstanding and it became a test of their loyalty and drove the true hearted back to the Bible to understand where they had gone wrong. The Lord wanted to see who would endure in spite of the disappointment. In our case, in spite of the future time prophecies that exist in both Daniel and Revelation, they will never again be a “test” like the pre and post 1844 experience. Instead, they will be “waymarks” that will confirm our faith rather than being a test. Those future time prophecies will not begin until the “fifth seal” is opened and the “fellowservants . . . that should be killed” (Revelation 6:11) for refusing receive the “mark of the beast” (Revelation 20:4). Those atrocities will probably last only “ten [literal] days” (Revelation 2:10) before Christ casts the censer “into the earth” (Revelation 8:5), but we can only be sure after the fact. Therefore, just as in Daniel’s case, the saints will be able to establish the beginning point of Daniel and John’s future time prophecies only retrospectively (sometime during post probationary time), never prospectively during probationary time. This is the major difference between the “bitter water” experience of Revelation 8:8,9 and the bitter book experience. 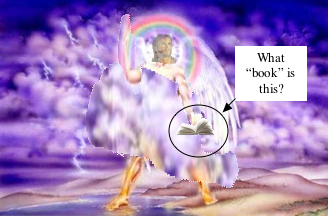 “Many men died” of the bitter waters, but, in the “bitter book” experience, many men lived to “prophesy again” with renewed hope after recovering from their bitter experience. So, being asked to “prophesy again,” confirms that God approved of what was formerly prophesied even though it was flawed. God didn’t even ask them to repent of their error, certainly not to abandon all study. He just asked them to go back again and see where they had gone wrong, then “prophesy again before” the world. Their experience, was, in effect, a “definite time” test. Those who passed the “test,” went back to the Bible and sorted out what they had misunderstood. Those who flunked, attempted to establish more “definite time[s],” or abandon any further study of the prophecies, if not the whole Bible. Those who went back to where they left off confirmed, with the help of God, that they were correct in their understanding of the 2300 years, but discovered to their amazement that the “sanctuary” of Daniel 8:14 was in heaven, not on earth and that Jesus had come to the Most Holy place in Daniel 7:9, 10 and 13, instead of the earth. That has now been more than 160 years in the past. By now, numerous false, predicted “definite time” settings have come and gone leaving in their train, more bitter experiences and dashed hopes. Many have come to the conclusion that the doctrines based on 1844 and the heavenly sanctuary are irrelevant. Whether they realize it or not, they are setting themselves up for drinking the “waters” made bitter” by Wormwood, the “great star” fallen “from heaven” (Revelation 8:10, 11). Those who reject the Bible altogether, are set up for Abaddon, the other “star” John saw “fall from heaven” (Revelation 9:1). Probably one of the most difficult trials to endure is the bitterness of disappointment caused by delay. Time setting, only intensifies the trial. It sets one up for a roller coaster religion with spiritual highs following bitter lows eventually ending in “a day when he looketh not for him, and in an hour that he is not aware of” (Matthew 24:50). In other words, we will always miss if we keep trying to set time. On the other hand: “Though no man knoweth the day nor the hour of His coming, we are instructed and required to know when it is near. We are further taught that to disregard His warning, and refuse or neglect to know when His advent is near, will be as fatal for us as it was for those who lived in the days of Noah not to know when the flood was coming.”  Furthermore, God Himself will eventually speak “the time” Himself when he declares the exact “day and hour of Jesus coming.”  Consequently, while “time setting” is God’s prerogative, knowing its nearness is a Divine imperative. Note also the great importance of the “midnight cry” known today as the “Millerite movement which stressed eschatological events—the resurrection, the last judgment, the punishment of sin and sinners”  including the “definite” beginning and ending date of the 2300 days of Daniel 8:14. The “wise” will look beyond the honest mistake in the event and treasure the “light” which will always shine “all along the path” to the holy city. Summary of chapter 10: This chapter is divided into two parts. The first part is a symbolic characterization of Jesus who is “clothed with a cloud” representing the “mystery” of His identity to the wicked, yet with his face like the sun and his feet as pillars of fire represents the clear understanding of the righteous who recognize fully that both Wormwood and Abaddon are Satan’s disguises actively working to deceive the whole world into deifying him as God during the final stages of the trumpet scenario that is left uncompleted at the end of chapter 9. Jesus’ “feet as pillars of fire” suggests the administration of justice as depicted by the sounding of the seven trumpets. Jesus’ loud, thunderous voice must be representative of the loud cry message which was fair warning to the world of the coming deception. 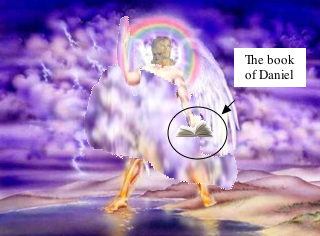 The second part of chapter 10 is the sweet/bitter book experience representing the honest misunderstanding of God’s people whom God allowed to base their disappointed expectation of His soon coming on a misunderstanding of the 2,300 days of Daniel 8:14 which really represented a change in Jesus’ heavenly ministry and not his second coming. The last verse represents Jesus’ charge to His church during probationary time: the three angel’s messages of Revelation 14:6-11. Remember that the “incense” in this case represents God’s sustaining grace in behalf of the saints during post probationary time, namely, the time of Jacob’s trouble, a precious concept that few have recognized. we can assume those who had “not the seal of God in their foreheads” (Rev.9:4) must have the “mark of the beast” depicted in chapter 13 because everybody, during that time in earth’s history will either have the seal of God or the mark of the beast. There will be no middle ground. see Revelation 14:20 where “blood came out the the winepress, even unto the horse bridles, by the space of a thousand and six hundred furlongs” probably from the “third part of men” that were killed in Revelation 9:15, 18. The loud cry is further expounded upon in Revelation 18:1-4 where the “multitude” that God calls “my people” is called out of Babylon. note that the world rejoices over the death of the two witnesses “because these two prophets tormented them that dwelt on the earth” in Revelation 11:10. It must have been the loud cry that tormented them. Manuscript Releases Vol.21, page 326 (brackets placing the quote in the third person, supplied) I believe this quotes typifies the experience of those enduring the time of the trumpets or more commonly known as the time of Jacob’s trouble. The Lord’s face represented as the “sun” and “his feet as pillars of fire” are apt symbols of what they are seeing (in the minds eye) during that time. The term “little book” is translated from one Greek word: “bibliaridion” (Strong’s #974) meaning: “a little book.” It is found four times in Revelation 10 and nowhere else in the Bible. The word “book” in Revelation 5 is from “biblion” 1) a small book, a scroll, a written document, 2) a sheet on which something has been written 2a) a bill of divorcement. 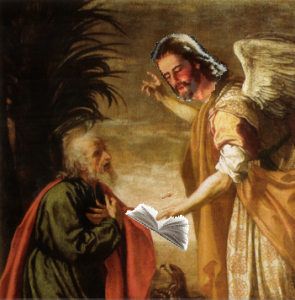 If the word “mar’eh” is unfamiliar to you, go back to our study of Daniel 8:14 -26 where Jesus told Gabriel in verse 16 to explain the “mar’eh” even after Daniel already said he saw the “chazown.” This is an important point that has escaped most of us. SDA Bible Commentary Vol.7, page 798 (top left column under “5. Lifted up his hand.”) Note the reference to Daniel 12:7 along with others. Here is a list of sources where Mrs. White used the term “definite time:” Manuscript Releases Vol.1, page 100; Vol.10 pages 268, 269, 270; Vol.16 pages 176, 177, 178; Vol.19 page 320; Spirit of Prophecy pages 225, 242, 290; Testimonies For the Church Vol.1 pages 56, 72; Vol.4 pages 307, 308; Spiritual Gifts Vol.1 pages 134, 152; Vol.2 page122; Early Writings pages 233, 246; 1888 Sermon page 956; Review and Herald 3-20-92; 3-22-92, 8-16-87, 8-21-88, 10-20-85; Maranatha page 136; Evangelism page 221; Life Sketches S8O pages 190, 205, 265; Life Sketches15 pages 62, 128; Life Sketches pages 88 190, 221; Great Controversy pages 353, 370, 456; SDA Bible Commentary Vol.6 page 1052; Vol.7 page 971; Last Day Events pages 32, 33, 35, 36; Selected Messages Vol 1 pages 75, 188, 189; Vol.2 pages 73; PH030 page 9; Signs of the Times 4-20-76, 4-22-80, 5-11-76, 10-8-02; Christian Education page 114; Publishing Ministry page 18; Fundamentals of Education page 137; 1888 Materials page 958. The concept must be important, otherwise why did she use it so frequently? if this seems out of line, go back and review our study on Daniel 12. If this puzzles, go back and review our study of Daniel 8:26 where Gabriel tells us that “the mar’eh’ of the ‘ereb and the boqer” is true which is the 2300 “’ereb boqer” or “days” of verse 14.
 consider this statement: “I was a firm believer in definite time in 1844, but this prophetic time was not shown me in vision, for it was some months after the passing of this period of time before the first vision was given me. There were many proclaiming a new time after this, but I was shown that we should not have another definite time to proclaim to the people. All who are acquainted with me and my work will testify that I have borne but one testimony in regard to the setting of the time.” (Manuscript Releases Vol.16, page 177) Therefore, “definite time” is synonymous with “time setting.” The phrase “definite time” can be found more than eighty times (see note #20) in the Spirit of Prophecy, therefore, we need to have a clear understanding of what it really means. “Indefinite time” is not time setting. A lot of heated arguing could be avoided if that were understood!